Mrs Koka Fukushima, today’s tutor for the International class requested practicing teachers arrange without a kenzan using leaves and/or flowers, otherwise if using branches the arrangement should low. My selection of leaves was New Zealand Flax and Philodendron leaves. I started trying to form a structure using the Flax leaves but I felt it looked too contrive. 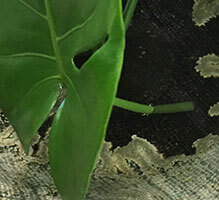 Studying the Philodendron leaves I took advantage that the holes are joined at the top thus providing some tension. Weaving the open parts and using the holes to thread the flax through the entire form created its own tension thus standing ‘relatively’ stable. I was delighted I managed to achieve this challenge through the ability to change tack to work with the material rather than being stubborn and sticking with the first idea.